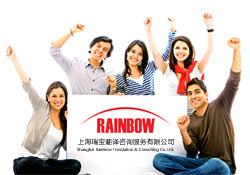 Shanghai Rainbow Translation & Consulting Co. Ltd.
Shanghai Rainbow Translation & Consulting Service Co. Ltd. was established in 2002. We boast a team of professional translators, interpreters, proofreaders, quality assurance and managers who are specialized and experienced in translation service. We have committed to build up a bridge of communication between China and the world, to provide the best translation service in an efficient and considerate manner, and to help you accelerate your business and career now and in the long run. Copyright © Shanghai Rainbow Translation & Consulting Co. Ltd. All Rights Reserved.